QPME FY17 Q1: Information and resources for a Marine's physical, spiritual, mental, and social fitness. "The relation between officers and men should in no sense be that of superior and inferior nor that of master and servant, but rather that of teacher and scholar. In fact, it should partake of the nature of the relation between father and son, to the extent that officers, especially commanding officers, are responsible for the physical, mental, and moral welfare, as well as the discipline and military training of the young men under their command." Fitness is a holistic approach to physical, mental, spiritual, and social fitness. Truly “fit” Marines have far more than just high Physical Fitness Test (PFT) and Combat Fitness Test (CFT) scores. Ensuring holistic wellbeing boosts morale, cohesiveness, and resiliency - enabling Marines to execute the toughest challenges and recuperate in shorter time. This guide contains information and practices to aid Marines in promoting, sustaining, and restoring their physical, spiritual, mental, and social fitness. 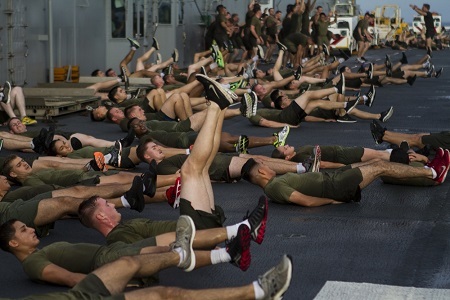 Noncommissioned officers with the 31st Marine Expeditionary Unit take part in physical training on the flight-deck of the USS Bonhomme Richard (LHD 6) conducted by the 31st MEU sergeant major, Sgt. Maj. Jim Lanham, Sept. 13, 2016. (U.S. Marine Corps Photo by Staff Sgt. T.T. Parish/Released). Photo courttesy of DVIDS. Learn about the Marine Corps' new fitness standards in this Corps Report.